This paper presents the results of measurements of 99mTc activity concentrations in indoor air in a nuclear medicine department and resulting estimated 99mTc intake by medical personnel. 99mTc air activity measurements were conducted at the Nuclear Medicine Department, John Paul II Hospital, Krakow, Poland, during ventilation–perfusion SPECT lung scans. Technetium from the air was collected by means of a mobile aerosol sampler with a Petryanov filter operating at an average flow rate of 10 dm3 min−1. Measured activities ranged from 99 ± 11 to 6.1 ± 0.5 kBq m−3. The resulting daily average intake of 99mTc by medical staff was estimated to be 5.4 kBq, 4.4 kBq, 3.0 kBq and 2.5 kBq, respectively, for male technicians, female technicians, male nurses and female nurses. Corresponding annual effective doses were 1.6 µSv for technicians and 1 µSv for nurses. The highest equivalent dose values were determined for extrathoracic (ET) airways: 5 µSv and 10 µSv for nurses and technicians, respectively. It is concluded that estimated annual absorbed doses are over three orders of magnitude lower than the dose limit established in the Polish Atomic Law Act and in recommendations of the International Commission on Radiological Protection for medical staff. Technetium (Tc) is a chemical element belonging to the seventh group of the periodic table (transition metal). Primarily, Tc is obtained artificially by fission processes of heavy nuclei, but it is also present in the Earth’s crust due to spontaneous fission in uranium and thorium ores. There are 32 radioactive isotopes and 11 metastable isomers of technetium known at this moment. One of the isotopes of technetium, namely 99mTc, is frequently used in nuclear medicine, especially in diagnostics with the Single-Photon Emission Computed Tomography (SPECT) imaging technique. Physicochemical properties such as low energy of the gamma-rays emitted during decay (140.5 keV, emission probability p = 99%), short physical half-life of 6.01 h and rich co-ordination chemistry (which allows creation of many useful chemical complexes) are the reasons for the wide-spread use of 99mTc in a wide range of diagnostic applications. It has been estimated that 99mTc is the most frequently applied radioactive isotope for examinations in nuclear medicine (IAEA 2008). A ventilation–perfusion lung scan is one of the medical imaging methods in which 99mTc is applied. This examination consists of two lung scans. The first part, the perfusion scan, allows assessment of the lungs’ blood supply and requires intravenous injection of technetium macro aggregated albumin containing 150 MBq of 99mTc. The second scan, the pulmonary ventilation scan, allows examination of the patency of the bronchial tree and lungs. Before scanning, a gas containing 400–500 MBq of 99mTc is inhaled by the patient through a mouthpiece or mask covering the nose and mouth. In the medical routine, technetium DTPA (diethylenetriaminepentaacetic acid) or Technegas (ultrafine dispersion of 99mTc-labeled carbon) is used as a source of the radionuclide (Jogi et al. 2010). At the time or shortly after inhalation of gaseous radioactive technetium, part of the 99mTc activity may leak into the room air and pose an additional risk of radiation burden for medical staff who perform examinations. To verify this hypothesis, a series of measurements of 99mTc activity in the air were performed. The experiment was carried out in a nuclear medicine department, during routine ventilation–perfusion lung scans. The present study was conducted at the Nuclear Medicine Department, John Paul II Hospital in Krakow, Poland. This unit is specialized in SPECT diagnostics and is supplied with a Siemens Symbia T16 SPECT/CT hybrid device. The following treatment protocols are routinely performed: myocardial perfusion imaging, bone scintigraphy, renoscintigraphy, and ventilation–perfusion lung scans. The medical staff consists of nine specialists (three technicians, four nurses and two physicians). The department is also equipped with a Cyclomedica Technegas generator that is utilized in the routine inhalation procedure. The department usually performs ventilation–perfusion lung scans once per week on Tuesday. Four patients per day and about 200 patients per year are usually diagnosed in the department. 99mTc activity concentration measurements were carried out during ventilation–perfusion lung scans on one specific day (10th September 2018). The experiment included collection of aerosol samples in two rooms—the first was a room with a SPECT camera and Technegas generator (called the acquisition room) and the second was a control room. The layout of the rooms is presented in Fig. 1. In each of the rooms, ten samples were gathered every 40 min to 1 h.
The rooms where the experiment was conducted were equipped with ventilation systems. Air exhaust rates were 1085 m3 h−1 and 60 m3 h−1, which gave ventilation efficiencies of about 8.5 and 2 air changes per hour for the acquisition and control room, respectively. During routine work, medical staff enters the acquisition room about twice per treatment, which results in additional ventilation of that room. The change of air volume due to door opening is difficult to estimate, but the authors believe that it is negligible compared with the highly efficient ventilation system. Aerosols from the air were collected by means of a mobile aerosol sampler that operated at an average flow rate of 10 dm3 min−1. Aerosols were captured using a Petryanov filter FPP-15-1.5 (poly(vinyl chloride)) manufactured by ESFIL TEHNO AS (Estonia). Those filters are commonly used for aerosol collection, due to their high collection efficiency, which can reach up to 97% (Lipiński et al. 2013). Due to the short physical half-life of 99mTc, right after sampling, filters were transported to the Institute of Nuclear Physics, Polish Academy of Science (Krakow, Poland). Subsequently, samples were compressed into pellets (5 cm diameter and about 4 mm height) and analyzed by means of a low-background gamma-ray spectrometer including a high-purity germanium (HPGe) detector manufactured by Ortec (GMX-30190-P, 30% relative efficiency). The electronics were based on NIM modules by Canberra and spectra acquisition and analysis were performed with Canberra Genie 2000 software. To determine 99mTc activity collected on the Petryanov filter, the intensity of the 140 keV gamma-ray line was measured. Efficiency calibration was done with a multi-gamma source SZN 40/10 by Polatom. The source had a disc-shaped geometry of 50 mm diameter and 5 mm height. The matrix density was 1.00 g cm−2. Such method has already been successfully applied for measurements of aerosol and gas activities over the past years (Mietelski et al. 2005, 2014; Masson et al. 2011; Brudecki et al. 2018a). Based on the measured 99mTc activity concentrations in air, annual organ equivalent and effective doses for the technicians and nurses were estimated. In the beginning, utilizing routine working schemes, the average time spent by medical staff in contaminated areas was established. To perform one test, the technician entered the acquisition room twice and spent about 5 min there each time, once to assist the patient during inhalation of radioactive technetium and then to position him/her on the imaging table. After treatment, the technician entered the acquisition room a second time and helped the patient to get up and leave the diagnostic room. The technician spent the remaining time in the control room. To carry out a perfusion scan, the nurse needed to enter the acquisition room to perform an intravenous injection, which lasted approximately 5 min. Routinely, there are four ventilation–perfusion lung scans conducted in the department per day and week. The next step involved estimation of the overall absorbed 99mTc activities in the respiratory system and in other organs of the staff. 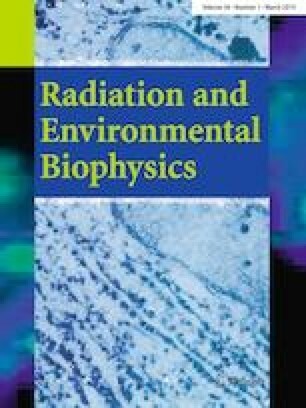 Calculations were made using a biokinetic model of technetium recommended by the International Commission on Radiological Protection (ICRP 2016) in combination with the human respiratory tract model (HRTM) (ICRP 1994, 2002) and gastrointestinal tract model (GITM) (ICRP 1979), developed ICRP. Computer simulations were performed by means of the SAAM II software from the Epsilon Group. In line with ICRP recommendations, in the performed simulations, lung clearance of Technegas was assumed as a Type F (fast) (ICRP 2002). The Technegas system’s manufacturer ensures that the size of most of the produced aerosols is in the range of 30–60 nm (Cyclomedica 2007). Therefore, the deposition of 99mTc aerosol fractions was calculated for an assumed activity median aerodynamic diameter (AMAD) of the attached aerosols of 50 nm. During work, the breathing rate of medical staff is adequate for light exercise. Aerosol deposition in HRTM for a 50 nm AMAD aerosol in light exercise is presented in Table 1. Other parameters used in the calculations are presented in Table 2. Finally, doses were calculated based on the time-integrated 99mTc activity (model of technetium biokinetics and computer simulations), radiation-weighted coefficients (SECALL program, Oak Ridge National Laboratory, Oak Ridge, TN, USA) and tissue-weighting factors according to the ICRP methodology (ICRP 2007). More details on the applied methodology of absorbed dose calculations are given in Li et al. (2008) and Brudecki et al. (2014, 2017a, b, 2018a, b). At the time of the experiment, 20 aerosol samples were collected, measured and analyzed. In the acquisition room, 99mTc activity concentration varied from 99 ± 11 Bq m−3 to 6.1 ± 0.5 kBq m−3. The activity of technetium systematically increased during the time the ventilation–perfusion lung scans were conducted. Soon after the last patient was examined, the concentration of 99mTc rapidly declined as a result of air changing due to the highly effective ventilation system and frequent opening of doors. The activity of technetium in the control room reached 0.85 ± 0.07 kBq m−3, which is one order of magnitude lower than in the acquisition room. In addition, analysis of the samples collected before first utilization of the Technegas generator on the experiment day suggested that due to previous treatments conducted in the department, a constant radiation background from 99mTc on the level of about 0.1–0.2 kBq m−3 existed (first samples collected in each room). The detailed results are presented in Fig. 2. It should be noted that, taking into consideration the sample collection times as well as the highly efficient ventilation systems installed in the department rooms, short-term 99mTc activity concentrations may have significantly exceeded the determined values. On the basis of the outcome of the 99mTc activity concentration measurements and taking into account the routine working time of technicians and nurses, daily activity intake was estimated. The results are as follows: 5.4 kBq, 4.4 kBq, 3.0 kBq and 2.5 kBq, respectively, for male technicians, female technicians, male nurses and female nurses. Detailed results are presented in Fig. 3. The last step in the present study was the estimation of the dose received by the medical team involved. The annual effective committed dose reached 1.8 μSv for technicians and 0.9 μSv for nurses. The highest equivalent annual doses were found in ET airways—10 μSv, 9.5 μSv, 5.7 μSv and 5.3 μSv, respectively, for male technicians, female technicians, male nurses and female nurses. The fact that the dose for nurses (both sexes) was a factor of 2 lower than that for technicians is the result of a shorter time of work in the contaminated area, namely, in the acquisition and control rooms. Detailed information is presented in Table 3. Internal and external exposures of medical personnel due to 99mTc have been described in some previous publications. Krajewska and Pachocki (2013) reported activities of 99mTc in thyroids of examined medical staff in the range from 50 to 1800 Bq, with an average activity of 1500 Bq. Internal contamination was also studied by Ferdous et al. (2012) based on monitoring of 99mTc activity in urine samples. Their reported values ranged from 9 to 314 Bq L−1 and corresponding doses varied from 0.4 to 15 μSv. Similar examinations were performed by Greaves et al. (1995) who collected 24 air samples during ventilation and imaging tests. They found an average 99mTc activity concentration in air of 4.4 kBq m−3, which implied a daily effective dose to medical staff of 0.004 µSv. These authors reported also that 10 min after inhalation, 99mTc activity concentrations in air decreased to background level (except for two samples where the concentration was less than 1.1 kBq m−3). External dose rates reported by Smart (2004) for technicians working with 99mTc were up to 100 μSv h−1. This value is similar to 43 μSv h−1 reported by Sattari et al. (2004). Another study (Forsa and Standen 2012) reported values of external radiation doses caused by 99mTc during various medical procedures, with an average of 1 nSv per MBq assumed as a representative value for Norwegian nuclear medicine departments. Direct comparison of both external and internal doses suggests that external exposure is responsible for most of the effective annual dose. In the present study, 99mTc activity concentrations in indoor air of a nuclear medicine hospital, as well as resulting absorbed doses for medical staff, were estimated. 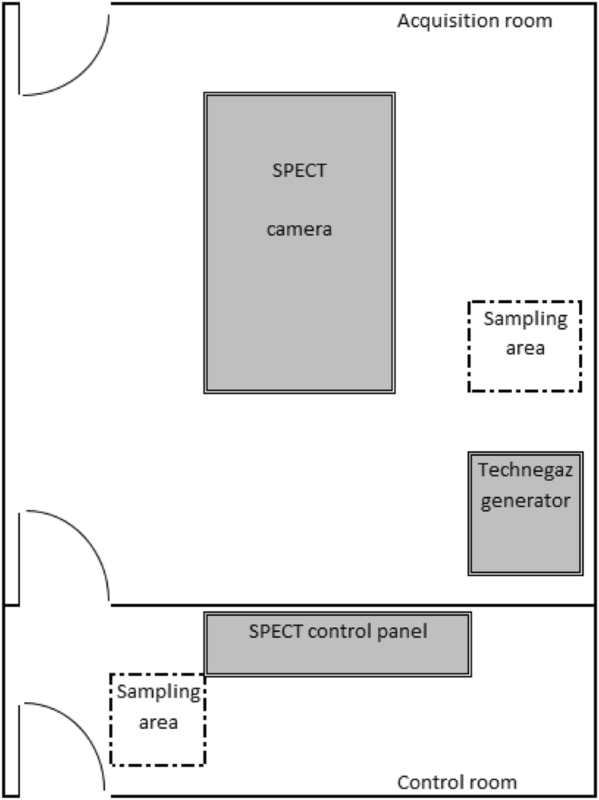 The study involved measurement and analysis of 20 aerosol samples collected in both the acquisition room and control room in the Nuclear Medicine Department, John Paul II Hospital, Krakow, Poland, during ventilation–perfusion lung scans. Although the technetium activity in the air and the estimated 99mTc intakes seem to be quite high, corresponding annual effective doses are rather low. Furthermore, calculated annual effective doses are over three orders of magnitude lower than the dose limit established in the Polish Atomic Law Act and recommended by the ICRP (corresponding to effective doses from 6 to 20 mSv per year). In the light of current knowledge, such doses do not pose any significant health risk for medical staff. However, the present study concerned only a small part of the daily working routine of medical personnel and, therefore, does not necessarily imply that 99mTc intake and associated doses will always be at sufficiently low and safe levels. Therefore, regular monitoring of internal contamination of hospital staff working with 99mTc is recommended. Furthermore, it should be mentioned that conducting more measurements would be desirable; however, currently this is not feasible because the sample collection technique used in the present study is highly burdensome for both medical staff and patients. Due to this, the presented results must be interpreted with caution and should be seen just as a first indication of 99mTc exposure in current clinical practice. This article does not contain any studies with human and animals performed by any of the authors.